I would like to share with the distinguished guests present today my experience as an economist. I became interested in economics when I was a sophomore at Cornell University. It was my fortune to have some excellent teachers who got me interested in the subject. In my junior year I discovered the journal Econometrica in the Library. Although I could not understand the contents of the articles published in this journal I was excited by the fact that mathematics was used to study economic problems. I decided to study mathematical approaches to economics. In 1951 I discovered that the U of Chicago was the only university offering a course with the title “econometrics.” Hence I went to the U of Chicago to study econometrics. After I went to Chicago I took courses from the faculty members affiliated with Cowles Commission including Tjalling Koopmans and Jacob Marschak. However the professor who had the most influence on me was Milton Friedman. Friedman has taught me that a good economic model is a simple model. If we can explain certain economic phenomena by one equation this explanation is better than a model using two equations. In Chicago I learned how to do empirical research in economics, namely, to formulate a hypothesis and then test its implications by statistical data. To start writing my PhD dissertation I needed to find a topic which was a difficult task. I was fortunate to be able to find a topic related to demand analysis. My topic was “demand for automobiles in the United States.” When I was writing my dissertation, the study of demand for food and other perishables was a well established field but the study of the demand consumer durable goods was still lacking. Hence my research on the demand for durable goods was an original piece of research. After completing my dissertation I was offered an assistant professorship at the Sloan School of Management at MIT. As a faculty member I needed to continue to do original research. After obtaining my PhD degree I have done original research on econometric method, including the well-known paper proposing the Chow test on structural change in regressions, on methods for estimating the parameters of a system of simultaneous equations to describe an economic structure, on time series analysis, on optimal control of economic system by using the Lagrange method rather than the method of dynamic programming and on the Chinese economy. An interesting question in economics is whether economic hypotheses are applicable in all countries. Indeed many economic hypotheses hypothesis are applicable to different countries. For example, Milton Friedman’s finding on the effects of increase in money supply on output and prices apply to all countries. According to Friedman, the effect of an increase in money supply on output is immediate but temporary. The effect on prices is delayed but long lasting. This finding applies to the Chinese economy, as I have discovered. Other outstanding examples of economic hypotheses which are applicable to all countries include: 1) A consumption function based on the permanent income hypothesis. 2) An investment function based on the accelerations principle. Concerning the accelerations principle, note that investment is a function of the rate of change in income, and not of the level of income. The desired amount of capital stock is a function of income, and investment is the rate of change of output. Hence investment is a function of the rate of change of income. have studied this principle using data on investment for many industries and many countries and have found the principle to be valid empirically. The Chinese economy has grown rapidly not only because of the policy of the Chinese government to introduce a market economy but because China has human capital of very high quality. Other countries have also adopted a market economy but have grown less rapidly because they do not have human capital of equally high quality. Thus adopting a market economy is a necessary condition for rapid economic growth but not a sufficient condition. Furthermore, an economy in an early stage of economic development is able to grow rapidly in the process of catching up. The rate of economic growth of China will slow down as the Chinese economy becomes more developed. According to the estimates of the World Bank and the IMF, China’s GDP has surpassed the US GDP since 2015. China is now assuming economic leadership in the world. It is helping many developing nations to develop their economies partly based on China’s own experience on economic development. One may still question whether China is capable of serving as the leading economy in the world – in terms of helping the developing countries rather than dominating them politically and economically. China’s one belt one road policy is helping many developing countries. This policy is also helping China in the utilization of its physical and human capital. It enables the Chinese human and physical capital to yield higher rates of return than the rates that can be earned if the capital were invested domestically. The study of economics can serve two purposes. The first is to understand economic phenomena. The second is to help formulate economic policies for the betterment of nations. I hope that the annual awards given by the National Economic Foundation will encourage many young Chinese to study economics and thus to contribute to the science of economics and to the economic development of China. 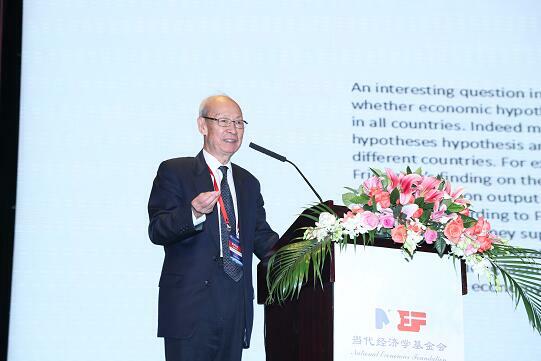 We all should thank the Foundation for providing this award as it will help promote economic research by Chinese economists and contribute to the economic development of China in the future.